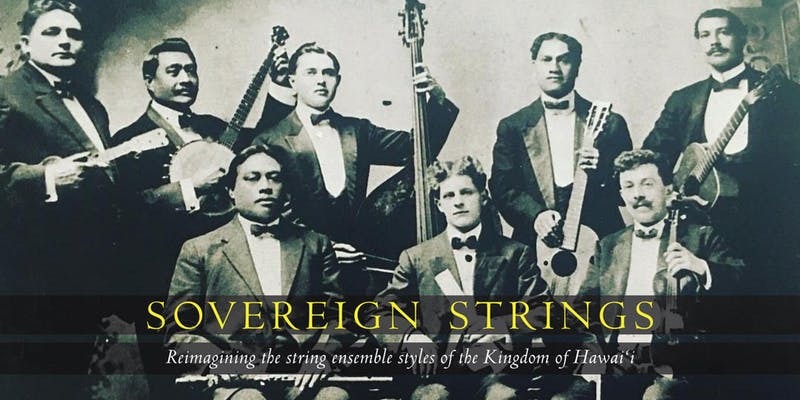 Join us for “A Night of Sovereign Strings,” a musical journey into modern music’s 19th century Hawaiian roots, as an all-star cast of instrumental and vocal virtuosi re-imagines the vibrant string ensemble styles of the Hawaiian Kingdom. Event Title“A Night of Sovereign Strings,” presented by Pu'uhonua Society as a fundraiser to benefit the newly formed Kealakai Center for Pacific Strings. Saturday concert benefits both organizations. DescriptionThe Sovereign String Band recaptures the diversity of musical cultures found in late-19th-century Honolulu, from ʻoli to opera, symphonic strings to brass, fiddle and banjo to flute and Hawaiian-style steel string guitar. Music historian Kilin Reece, in collaboration with Maestro Aaron Mahi and 14 of Hawai‘i’s award-winning musicians, brings to life Honolulu’s legacy of influence in the world of music. Hawaiian musicians synthesized the diversity of the Hawaiian kingdom’s musical cultures into a unique brass and string ensemble sound that would delight audiences around the world. Tracing the lives of these musicians and their music reveals a largely untold chapter of Hawai‘i’s role in shaping not only the history of modern music, but also the designs of the most iconic and widely used stringed instruments in use to this day. Founded by Kilin Reece in 2019 in honor of legendary musician Mekia Kealakai, the Kealakai Center for Pacific Strings is a nonprofit dedicated to illuminating the excellence, innovation and contributions of Hawaiʻi to the world of music, as we know it today. Pu‘uhonua Society creates opportunities for Native Hawaiian and Hawai‘i-based artists and cultural practitioners to express themselves and engage with and impact audiences. We support artists and makers who serve as translators, mediators and amplifiers of social justice issues in the community. For more information, visit puuhonua-society.org.